Balloons are not just for decorating anymore. Colorful, fun and inexpensive, it’s no wonder they’ve become a versatile tool for creative party planners everywhere. From the invitations to the party favors, these ideas will show you how to build an entire party theme around the simple balloon. 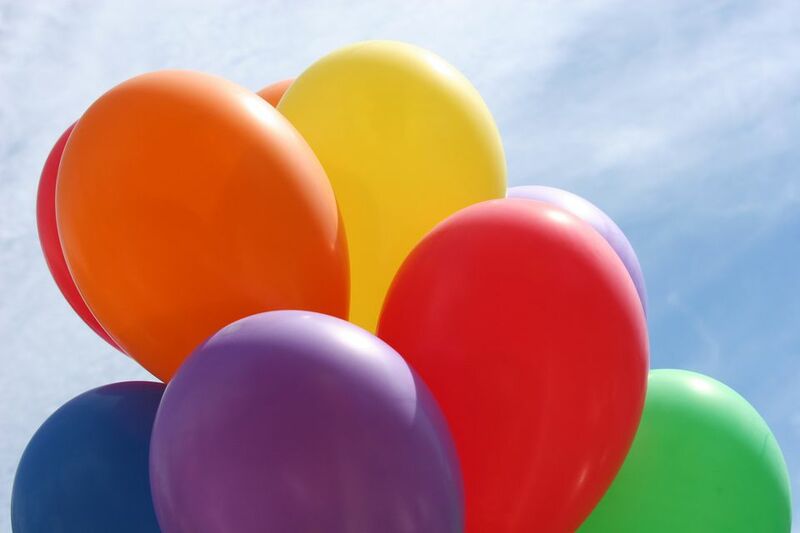 If hand-delivering, you can inflate the balloons, tie them closed, write the party details on the outside, and simply pass them out to your intended guests. Another idea is to print your invitations and roll them into a small scroll. Inflate the balloons, stick the scrolls inside and deliver them by hand. Tell guests to pop the balloons to find their invites. Another option is to inflate the balloons, but leave them untied. Then, write the party details on the outsides. Deflate the balloons, and place them in envelopes. Add a note instructing guests to inflate the balloon to see an important message. Tie ribbon from helium-filled balloons. Attach decorations that fit your party theme to the ends of the ribbons (for instance: mini snowflake ornaments for a Frozen theme or paper tiaras for a princess theme). Let the balloons float to the ceiling so the decorative attachments dangle just overhead in the party space. To dress up your party’s dining table, tie a helium-filled balloon to the back of each chair. Another idea is to use your party favors as balloon weights and have a balloon floating above each place setting. Want to save on helium? Instead of dangling ribbon from the balloons, dangle the balloons from ribbon that is tied to the ceiling. Tape enough balloons to cover an entire wall to create a colorful backdrop. Arrange balloons along a wall to spell out a message like “Happy Birthday” or in the shape of a number 1 for a first birthday party. Create a winding pathway to your party by placing golf tees in the ground and attaching balloons to them. For an evening party, insert glow sticks into balloons before inflating, and then hang them around the party space to create awesome balloon-lighting. Balloon Drop: Fill a large net with balloons and tack it to the ceiling. Once your party guests are gathered under the net, have someone release the balloons from the net so the kids are showered with them. Confetti Balloons: Fill balloons with confetti. Toss them into the air and pop them (have an adult do the popping) above the kids’ heads. Balloon Faces: Give each party guest an inflated balloon and a set of colored markers and a variety of craft items (stickers, glitter, ribbon, etc.). Challenge them to turn the balloons into funny faces. Balloon Dart Painting: Fill balloons with a few squirts of paint. Inflate them and attach to a painted canvas. Give kids plastic darts to throw at the balloons. When the balloons pop, they splatter paint onto the canvas. Once all the balloons are popped, the painting is complete. Let each player take home his creation as a party favor. So, you can’t really eat balloons, but you can eat balloon cookie pops, a balloon fun cake or a variety of food cut with a balloon-shaped cookie cutter (such as sandwiches, mini pizzas, pancakes or marshmallow cereal treats). You can also attach miniature, inflated balloons to toothpicks and use them as cupcake toppers or tea sandwich toothpicks. Fill a balloon with small goodies. Inflate and tie closed. Kids can pop them open at home to find their treats. Fill a small basket or favor box with your party treats. Use string to attach a helium-filled balloon to the basket, so it resembles a hot air balloon. Make balloon animals and give them out as party favors.